Do you have a random “cold spot” in your dining room or perhaps in an area where a sweater is always needed, no matter how high the thermostat is set? Thermal bridges may be at play. 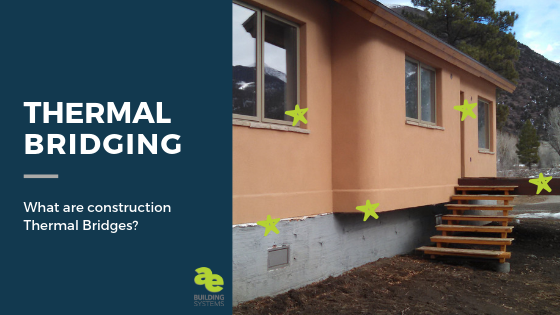 If you don’t work in or around construction, you may have never heard the term “thermal bridging”–but you’ve likely felt its effects. In a nutshell, it’s the movement of heat across an object that is more conductive than the materials around it. Thermal bridging not only causes a loss of heat within the space, it can also cause the warm air inside to cool down. As we approach the coldest season of the year, this means higher utility costs and potentially uncomfortable shifts in temperature inside your home or building. When heat attempts to escape a room, it follows the path of least resistance. Likewise, the same process occurs during the summer, only in reverse, allowing heat to enter your otherwise cool building. The junctions between the wall and the floor, roof, or doors and windows. What does all of this mean for you? In addition to poor climate control, there are several other lesser-known (but still serious) effects caused by thermal bridging. Thermal bridges can increase the risk of condensation on internal surfaces, and also cause condensation within the walls. Both can lead to mold growth, which in turn can cause unpleasant odors, poor air quality, and most importantly long-term health problems. Additionally, unchecked condensation may eventually cause rot and structural damage. Thermal bridging can have a significant effect on the energy efficiency of windows. The frames and spacers are the primary culprits. Spacers are the, typically metal, “strip” that goes between and separates the glass on double and triple pane windows. Different materials have different conductivity and impact the performance of the windows differently. Condensation on a double pane window is generally due to the spacers. With retrofit situations, knowing exactly how old a window is, as well as the component materials, can provide you with a general idea of its efficacy. Unfortunately, if your windows are rather dated or just poorly made, it is nearly impossible to add thermal breaks into an existing framing system. By their very nature, roofs and foundations present a large number of challenges in terms of maintaining a thermal boundary. Drains, vents, and holes for pipes and wires (amongst other things) create unavoidable penetrations in the building envelope and insulation. Heat transfers from the building into the ground or from the building into the air are often inevitable, though they can be minimized. Bottom line? In new construction, design it right which a whole topic in itself. With existing homes, if you suspect there is thermal bridging occurring in your space, you need to eliminate or reduce the effects as much as possible. Updating and/or adding insulation to your home – ideally adding a continuous insulation layer. Studies show that in an otherwise airtight and insulated home, thermal bridges can account for a heat loss of up to 30%. Whether you’re building a new home or retrofitting an existing structure, care should be taken to avoid unnecessary breaks or penetrations so that the possibility of thermal bridging decreases. If you’re looking for ways to minimize thermal bridges in your next project or existing home, contact us today. Previous Previous post: What is Continuous Insulation and Why Does It Matter?